Kick back and relax with your loved ones when you take your vacation to Kings Dominion in beautiful Virginia. Enjoy fun and laughs on the trip of a lifetime. This thrilling theme park is home to 12 amazing coasters, Snoopy-themed entertainment for the kids, live music, and delicious foods the whole family will love. From funnel cakes and ice cream to pizza and Chick-Fil-A, the in-park food options at Kings Dominion will keep you fueled throughout your visit. You can even purchase a dining plan or drink pass that offers unlimited refills on soft drinks. 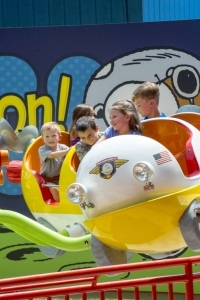 Don’t forget to plan time for Soak City, the Kings Dominion water park. This splash-tastic adventure park allows you to soak up the sun during the warmer months. Water slides, wave pools, and cabanas have something to offer every vacationer. You can also become a junior paleontologist when you check out Dinosaurs Alive! This animatronic dinosaur exhibit brings prehistoric reptiles to life. From remote-controlled beasts to a junior dig site, this immersive experience will delight the whole family. At aRes Travel, our Kings Dominion deals offer limitless fun and frolics at bargain prices. We offer discounted tickets, hotel accommodation, and vacation packages that allow you to create the ideal vacation bundle for your family. Booking your vacation doesn’t have to be stressful. Let the friendly planning agents at aRes Travel take care of the details, so you don’t have to. For exclusive Kings Dominion deals, including amazing savings on park entry, giant discounts on hotels, and some of the lowest prices on travel, call 1 (800) 434-7894 (international callers use +1 (619) 546-5622) to speak with an aRes Travel planning expert seven days a week, or book online now.